Almost a decade ago, three young Muslim girls were denied entry into secondary schools, and in what appears to be a similar situation, another young girl, 12-year-old Kalifa Logan, is being denied entry to St Charles High School in Tunapuna, because of her "dreadlocks." Speaking to Newsday yesterday, the girl’s distressed mother Lynette Marshall said that one week before her daughter was due to start school, she called the school to get information on the school uniform. She said it was then that school principal, Sister Adrianna Noel, requested a meeting with her. Marshall said she was told that her daughter would be unable to attend the school because her dread locks were not in keeping with the school’s dress code, or its policy. When Newsday contacted the school yesterday, principal Sister Noel said she was aware of the situation and admitted that the teen was denied entry to the school because of her hair. After a public outcry over the action, Archbishop Gilbert finally stepped in yesterday and gave his ruling, apologising and welcoming Logan back. 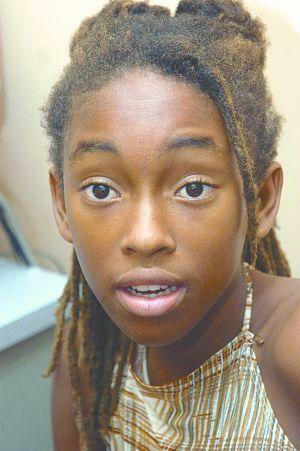 An apology and a ruling by Archbishop Edward Gilbert that 12-year old Kalifa Logan should be allowed to take up a place at St Charles High School have been vehemently rejected by Logan's mother, Lynette Marshall. Marshall said she believed that her daughter would be discriminated against at St Charles, having been initially refused because of her dreadlocks. And, though Gilbert apologised via a faxed statement to the media, the angry mother said she wanted a personal apology from him for the public humiliation her daughter has had to suffer ever since being refused entry by the Catholic-run school three weeks ago. Gilbert was asked to intervene yesterday and, following talks with the Episcopal Delegates for Education, Social Justice and Communications, the Catholic Education Board of Management and the principal of St Charles, he said Logan was not refused for "religious reasons". His statement added that she would be welcome to take a place at the private Tunapuna school "without prejudice, should she wish to do so". But Marshall insisted that if principal Sr Adrianna Noel was not removed, Logan would not attend St Charles for fear of further victimisation. "Discriminated once is to discriminate for life. Once that nun is in the school, teaching or even sitting in that school... Kalifa Logan will never be anywhere near that woman. That woman will be like a living nightmare in my daughter's life," an upset Marshall said. Asked if Sr Noel was removed as principal, if she would consider sending Logan to the school, Marshall replied: "I don't mind." However, Logan is not eager to attend the school, saying she would prefer to attend schools like Bishop Anstey High School East in Trincity, or the El Dorado Secondary School. "I only want to go to school," Logan added. The Ministry of Education said in a statement last night that it was pleased the Archbishop had intervened. "In the event that the Logan family chooses not to take up the place at St Charles High School, the Ministry of Education has alternative proposals for their consideration," it said, adding that it would continue its efforts to contact the family to ensure Logan could start secondary schooling at the earliest opportunity. Imam Yasin Abu Bakr on Tuesday opened the doors of the Jamaat al Muslimeen's Mucurapo Islamic College to Logan in the interim, for which Marshall said she was grateful but would have preferred a school closer to their home. Marshall told the Express that Logan had been brought up as a "pure and true Rastafarian" all her life, never having eaten meat, never putting a comb, brush or scissors in her hair, and never having been touched by anyone. The mother of five said she never experienced any trouble like this with her three elder sons, who are also Rastafarians and who attended secondary and tertiary level institutions. Responding to concerns raised by Secretary General of the Sanatan Dharma Maha Sabha Sat Maharaj about parasites, Logan said: "It must be him that have that."